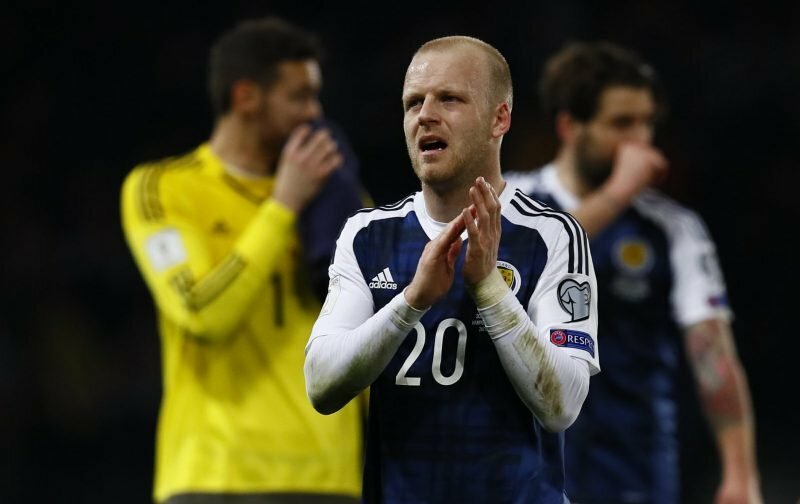 Jonny Hayes was the first victim of Morelos Law as assistant referee David Roome watched Steven Naismith kicking out at the grounded Celtic winger. The incident was in full view of Roome with referee John Beaton also seeing what happened. Lineman’s restricted view of Steven Naismith putting the studs into a Celtic player who is lying injured. Standing in front of the Wheatfield Stand may have played a part in the assistants decision but a week earlier David McGeachie discovered that assistants are well served to look the other way when players kick out. McGeachie watched Alfredo Morelos kick out at Scott McKenna, raised his flag with his decision slated by the SFA when a red card was reduced to a yellow on appeal. With those factors in mind Naismith escaped any punishment for twice kicking out at a grounded footballer then yelling in his ears. Allowing Naismith, Kyle Lafferty and the other Tynecastle boot boys to do as they please is one more reason why skilful players tend to body-swerve the Scottish game.